I feel a little bit grumpy this morning. I feel kind whiny. I feel kind of like complaining. -John has regressed in his potty skills (if that’s at all possible). Not only does he poop in his pants daily, but it’s a kicking screaming battle to get him to use the potty. Every. single. time. I’ve tried the treats, and I’ve even done some threats (‘if you fuss and scream you will lose one of your cars’ and yes, I’ve thrown away his precious cars). It’s still a battle every single time I say, ‘let’s go and use the potty’. I just don’t know if I have the energy to hold out with this stubborn child. Maybe I should just let him go back to wearing diapers. Until he’s 15. -We got a call from the scout master last night. Cole and 3 other boys were sick with the flu and he was sending them home. The poor kids. Actually, two more came home later. It sounds like Cole is the least sick of them, as he only threw up once or twice in the nurse’s station. I think he was just exhausted, maybe overheated. That and they had hot dogs for lunch. But of course we got the call just as we were about to leave for a swimming party at our friend’s mansion (they used to be our neighbors, but they’ve moved up in the world and now have this incredible house with a pool). We decided to go to the party and told our babysitter (Cole’s friend) to call us when Cole came home, and we’d come home and take care of him. So, right when they were bringing out the incredibly yummy tri-tip roast, we got the call. Umm, we’ll be home in about 20 minutes (after we eat some yummy food). But we got a call later from another scout’s mom (who was at the party, but didn’t know her son was sick, since he was in the second round of kids being brought home), who asked if Cole was still throwing up. Her son was throwing up every 15 minutes. Those poor kids. But at least they are home safe and not injured or eaten by bears. I expect Cole will probably sleep the whole day and then feel much better. -My house is a mess. -Megan comes home from her camp today. I hope she’s not sick. I hope she had a good time. And I hope when she sees her really clean room with a new bed and a new bed spread (not painted yet, of course) she doesn’t just say grumpily “Where’s all my stuff? !” (the answer to that question would be in a box in her closet, not in the trash). So, there it is. There’s my complaining for the morning. And when I think about other moms who are going through treatment for brain tumors or the moms whose kids are really sick and they have to worry about rising hospital bills and who are holding a benefit concert tonight but worrying if people will come to it, or my dear friend who just lost her mother-in-law to a long hard battle with cancer, then I just shut my mouth and stop complaining and start counting my blessings. Well, I’ve gotten the kids’ rooms cleaned, organized, threw out bags of stuff, built new bunk beds, and moved dressers. Everyone now has a dresser and a bed in the room where they are sleeping. I’ve patched some wall damage and bought a new bedspread for Megan’s queen bed, and now it’s time to paint. Only I’m a chicken. I’m afraid of painting. It’s so much work and it takes so dang long, and there’s all that taping and I’m not the best painter (lots of mistakes and smudges, people). And I’m afraid to commit. I’m a paintophobe. Which is funny. My neighbor teases me because she thinks I’m this ultra quick decision maker since I bought a new couch and love seat in one visit to one store. So after I told her on Sunday that we were moving bedrooms this week, she called me on Monday and said, “so are you painting right now?” Um. No. I’ve had to buy two bedspreads (one which I will take back) and I’ve rearranged furniture several times. And I don’t know what color paint to buy. So help me out, if you would. Here’s the bedspread I’ve got for this room. The colors are a little bit brighter in person, but you get the idea. So when I asked Megan what colors she’s like on her wall, she said green and blue. Green like the grass, and blue like the sky. Hmmm. We have a green carpet in there, and one wall already has a castle mural painted on it. I’m not painting over that. I don’t care if it doesn’t match with the rest of the room, it took me a long long time to paint that, and I’m not ready to give it up, dangit. So, I was thinking of maybe a light turquoise paint on the top 2/3, and maybe brown on the bottom 1/3 of the wall. 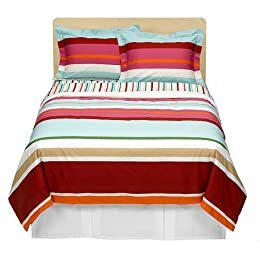 But would that look ok with the green carpet and this colorful bedspread? IEEEk. I’m not a decorator and I don’t play one on tv. I’m not very good at this kind of stuff and I need some help. Maybe I should call my neighbor. Any thoughts? Como se diz … em portuguÃƒÂªs? Ryan is having a little Portuguese practice this week.Ã‚Â He’s training a Brazilian guy at work from Control 4 Brazil, and apparently all that thinking is frying his brain.Ã‚Â I’m kind of glad it’s not me.Ã‚Â It’s been quite a few years since I have spoken German for any length of time, and I know it would be a struggle.Ã‚Â But if indeed we are going to travel to Brazil in the next year for the dedication of a new temple there, he’s going to have to brush up on those language skills.Ã‚Â ‘Cause heaven knows I’m going to be absolutely no help in that department. 10. Why CanÃ¢â‚¬â„¢t Mr. Fork and Mrs. Electrical Outlet be Friends? I thought this would be a welcome break than hearing me go on and on about my week of organizing.Ã‚Â It’s going ok, by the way, and I’ll have to post some before and after pictures whey I get to the after part. Can we please be done? Yesterday I worked like crazy. Mostly on Megan’s room. I removed two bags of trash, one bag for DI, and cleaned and organized her closet. UGH. We needed a new bunk bed for the girls, so we met Ryan at IKEA. It was actually kind of a fun outing. The girls got to go in Smalland (John can’t go until he wears real underpants–those meanies), we had a fun dinner of meatballs, ceasar salad and mac and cheese, and we found a bunk bed (which was actually priced less than that is listed). I also got a new quilt cover bedspread thing for Megan’s queen bed, but when I got it home realized that it won’t work for her bed. Duh. When we got our large flat boxes home, we had to haul them into the house (Ugh! ),and then proceeded to build the bunk bed. The kids (all THREE of them) were so excited, they were running around getting in the way. We got it put together with a minimal amount of swearing (luckily when Ryan dropped the drill, it didn’t land on anyone).Ã‚Â That may be our only trip to IKEA ever again, at least as far as Ryan’s concerned.Ã‚Â He said that now he won’t be able to think of that store without remembering that if you buy it, you must build it. Stage four–Wonder what in the world we have gotten ourselves into. Unfortunately, that shoulder/back injury I had from yoga the other day is back again.Ã‚Â Probably from lifting heavy stuff and carrying it up the stairs.Ã‚Â Or it could be from any number of things I hauled around yesterday.Ã‚Â But it was a painful night’s sleep, and now anytime I move anything (arms, back, shoulders) I feel a short stab of pain.Ã‚Â Oh the joys.Ã‚Â And the hall up there is also kind of a death trap, if you want to know the truth. I’ve got John’s car bed standing up in the hall (he’s decided he doesn’t want to use that bed anymore, he just wants to sleep on the bottom bunk of “Cole’s bed”); plus the crib mattress against another wall. The central vac is of course in the way of anywhere you want to stop, so you could trip over that.Ã‚Â We took apart Natalie’s old twin bed, which was falling apart, and now it’s in pieces up there.Ã‚Â I don’t know what to do with it.Ã‚Â Welding project, anyone?Ã‚Â There’s also a box spring that we don’t need now.Ã‚Â It’s on the porch waiting for someone from freecycle to decide they want it and come and pick it up.Ã‚Â Nothing says ‘white trash’ like a box spring on the porch, now does it? Stage five–lay on the floor and cry because of all the work that’s left to be done.Ã‚Â (It’s similar to stage four, but it’s kind of the ‘morning after’ stage.Ã‚Â If you couldn’t tell, that’s the stage I’m in now.Ã‚Â I don’t know if I’ll even get to picking out paint for Megan’s room, let alone paint this week.Ã‚Â There’s so much stuff on the floor in both Natalie and Cole’s rooms that it will take me all week just to try to organize that.Ã‚Â Help me Calgon, take me away.Ã‚Â No.Ã‚Â Seriously–take me away. This week is camp week. My oldest, Cole, will be gone at scout camp until Saturday. He left this morning at 6 am. He has a very experienced and competent scout leader, who I really do trust. But, still, I had to give him the little talk yesterday. The talk in which I express my expectations that my son be returned to me safe, sound, and intact. With two working legs, two arms, and still breathing. You know, minor details like that. He assured me that all would be fine. My next oldest, Megan, will be gone to Clearcreek, which is Alpine District’s summer camp. She left this morning at 6:30 am, and will return on Friday. I really have no idea if the employees there are competent, but since Cole had such a good experience when he went two years ago, I’m confident and hopeful that Megan will also have a great time. She’s going with 5 of her friends from the neighborhood and school, so I’m sure it will be a blast, and she’ll come home singing all those silly camp songs until I want to rip my ears off of my head. So, you ask yourself, what is Paige going to be doing this week with only 3 kids? That’s almost 1/2 the number of kids she usually has. Is she going somewhere fun? Hanging out and enjoying the quiet? Well, I would do those things, had we not embarked on a huge project this weekend. Yes, we have started the great bedroom migration of ’07. I have been thinking about and trying to figure out the best room placement for the kids for quite some time, now. We have three bedrooms for 5 kids. Cole’s had his own room for quite some time, now. He also has the queen bed, so his room doubles as the “guest room”, and when we have guests, he goes down to the pull out couch in the unfinished basement. Well, Megan has been complaining about sharing a room with Jenna, Natalie has been complaining about sharing a room with John (she wrote a note to Dad saying that John was ruining her life, in fact). Plus there’s the closet issue. Cole’s room has a large closet. Natalie’s room has two closets (she uses one for clothes and one for toys and stuff). Megan’s room has one closet. Shouldn’t the room with only one closet house the smallest amount of people? After discussing the possibilities, we called a family meeting to discuss the proposed changes, and everyone seemed agreeable to switching. So, John goes in with Cole, and they have the bunk beds that have been in Megan and Jenna’s room. The queen bed goes to Megan’s room, which will become the new “guest room”. Jenna moves in to Natalie’s room, and we buy them a new bunk bed. And everyone gets speakers in their rooms, thanks to Dad. So we got to work on Saturday. We had to clean up stuff, vacuum, take apart beds, clean out closets, strip sheets, do about 100 loads of laundry, and put the bed together in their new places with clean sheets. That’s about as far as we got. Jenna has no bed at the moment, as I haven’t yet bought the new bunkbed that I promised them. Her dresser is also not moved to the new location because John’s car bed is still in there. John’s dresser is still in his old room, too. Megan’s room needs to be cleaned, vacuumed, and rearranged. It also needs to be painted. This week. Natalie and Jenna’s room also needs to be put together, bed bought, dressers arranged, and all of JOhn’s stuff taken out. It needs to be painted, too, but not neccesarily this week. What’s the rush on Megan’s room, then? Well, it’s houseguest season. My brother’s family will be staying with us in two weeks, and there’s a good possibility we will have Robin and kids here this weekend. So, while my two oldest, most helpful kids (the ones who babysit) are gone, I will be moving furniture, cleaning up rooms, throwing away stuff, picking out paint, and hopefully actually doing the painting. I’d love some help, if you’d like to come over. And from the “it’s only funny because it’s not happening to you” file..
Friday night we watched my cousin’s kids so they could go to the temple. They have three darling little girls, ages 6, 3 and 6 months. Perfect ages to play with Jenna and John. So, I held the baby, fed her a bottle, and played with her while the other kids played outside on the trampoline and Ryan mowed the lawn. After he came inside, she was a little fussy and so I gave her to Ryan to hold for a few minutes while I got the other kids a snack. He took her into his office, and then next time I walked by he had her upside down to try to calm the fussiness. He brings her up and she starts spitting up on him. I run to go get a towel (he would say I walked leisurely, but really, I was hurrying) and by the time I got back, she had spit up the entire contents of the bottle I just gave her ALL OVER RYAN. I took the baby so he could wipe himself off, and then he went to change his shirt. I was laughing so hard! It’s been a while since we’ve seen spitting up of that magnitude, and it was quite funny, in my opinion. We’re glad there was no spitting onto the laptop, keyboard or anything that could be ruined. In fact, most of it was squarely on Ryan. I’m still chuckling over it. Sorry, Ryan. This week, my friend and neighbor called me and asked if I could help her with some sewing. They had a family wedding, which was luau themed, and her family all had to be wearing tropical prints. She had bought fabric and wanted to make wrap skirts for her 4 girls and herself. But she doesn’t sew. She had handed out fabric to different people, and asked me if I could do just two skirts for her smallest girls. Now, I’m not a seamstress by any stretch of the word. Yes, I can sew. I have sews some dresses, curtains, etc., but I don’t use my sewing machine every day. But–sew a hem, maybe an elastic waist? Sure, I can do that. So, I sewed a simple elastic skirt, then took it over to see if it fit right before I did the other one. You would have thought I had hand woven the fabric and sewed it with golden thread, to see their reactions. They were thrilled. So, I whipped up the other skirt (seriously, it took about 1/2 and hour) and took it over. Yesterday she called back again. She had asked another friend to just hem up the edges of the other three to make wrap skirts, but it was too much fabric and too stiff and it wasn’t falling right. So she came over, we figured out how much to cut off to make it the right length, and to make one of them not so bulky. I think it was four cuts and four seams. Again, so much appreciation. She went on and on about what a great talent that is to be able to sew (a straight line) and what a wonderful friend I was to help her. She even insisted on paying me $20. I felt undeserving of her gigantic praise. In a smaller way, John also shows his appreciation.Ã‚Â As I was helping him use the potty this morning, he was going to watch his hands, and he noticed that there was a new soap.Ã‚Â (Not the lovely brown sugar and fig from Bath and Body works/smelly kind that Ryan can’t stand, but a different foamy kind. )Ã‚Â John said, “MOM!Ã‚Â There’s new soap!Ã‚Â And there’s no polka dots!Ã‚Â Thanks!”Ã‚Â He doesn’t like the scrubbing micro-beads.Ã‚Â This family is pretty picky about their soap, I guess. But it’s nice to be appreciated, isn’t it? Ok, I admit it–I am lucky. I do win kind of a lot of things. But lest you think I just phone and win every thing I try for, I really don’t. I phone in and LOSE many times a day. Really. So, it’s an averages thing. If you want to win a few things, you have to enter and try to win a lot of things. That said, I won! I WON! When my kids found out about it, they were very excited, until I told them that it was only a trip for 4. And we’ll have to see who is the nicest to me to see if they get to go. Aren’t I mean? It’s full blown summer around here. You know how you can tell? Well, here are some sure signs that it’s summer at my house. –We are our of bread. And milk. Constantly. –The blow up pool comes out. –When I make macaroni and cheese, I cook up 3 or 4 boxes at a time, and there are very few leftovers. –At any given time, there may be 10 kids here. Or there may be none. –Otter pops; and lots of them. –I seem to care a lot more about the state of my toes. –The kids say something like, “can we eat lunch outside?” and I say, “Um…Ok.” instead of asking why in the world they would want to eat outside. –The kids stay up late to play. Last night, in fact, Cole was at one friends playing night games, Megan and Natalie were at another neighbor’s playing wiffle ball, and Jenna and John went to another friend’s house to play. All after 8:00 pm. –We go to the library once a week. At the present time we have 56 items checked out. That is a potential nightmare when it comes to returning all of those items, you know. But it’s a risk we’ll have to take to raise readers. –Every day is a celebration. It seems there’s a pot luck, party, someone’s anniversary, family party, celebration or what have you every single day. Not that I’m complaining, since I’ve planned about half of them, but it makes it dang hard to stick to any kind of a diet or meal plan with so many eating out opportunities. –There’s some sort of sunscreen opportunity every day. –Shoes? Where have all your shoes gone? Are these your shoes? Who’s shoes are these? We don’t even have anyone who wears this size. If all the neighbors brought all the stray shoes and put them in a pile in the middle of the road, it would probably block traffic. I have one friend who said she keeps a crate or a basket on the front porch, and puts all the extra shoes (not belonging to her own family) in the box. I think that’s a good idea. –There’s really nothing good on tv. All the regular shows are off for the summer, and the new replacement shows are things like “Who will he pick to date, a 20 year old or a 45 year old.” Whatever. Thankfully there are some movies to tivo, reruns of Gray’s Anatomy tonight, and Studio 60 on the Sunset Strip. –Dinners become pretty lax. Scrambled eggs sounds like a pretty good dinner, sure. So, those are some of the signs of summer here at our house. What are some of your sure signs of summer?